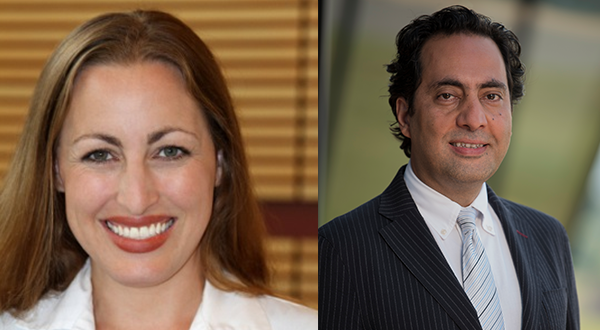 Michael Mosier Defeat DIPG Foundation is excited to announce that Dr. Michelle Monje and Dr. Javad Nazarian have joined its Scientific Advisory Council. Michelle Monje, MD, PhD is an Assistant Professor at Stanford University in the Department of Neurology and, by courtesy, the Departments of Pediatrics, Pathology and Neurosurgery. She is also a member of the Stanford Child Health Research Institute, Stanford Institute of Stem Cell Biology, the Stanford Cancer Institute and the Stanford Neuroscience Institute. She is a practicing neurologist and pediatric neuro-oncologist at the Lucile Packard Children’s Hospital at Stanford. Dr. Monje’s research group studies the molecular and cellular mechanisms of postnatal neurodevelopment and pediatric glioma pathogenesis, with an emphasis on microenvironmental contributions to glioma pathogenesis. Her laboratory has a long-standing focus on DIPG. Javad Nazarian, PhD is an Associate Professor of Pediatrics at the George Washington University and the Scientific Director of the Brain Tumor Institute at Children’s National Medical Center in Washington DC. Dr. Nazarian has been pioneering strong national and international collaborations in an effort to establish a robust pediatric brain tumor program. The DIPG Program at Children’s National, directed by Dr. Nazarian, has strengthened its collaborations over the past year in its work with the Children’s Brain Tumor Tissue Consortium (CBTTC). Dr. Nazarian leads the a DIPG-focused initiative—Project Open DIPG—to bring all known DIPG data and resources under one umbrella in order to enhance data accessibility accelerate discovery. The Scientific Advisory Council is chaired by Darell D. Bigner, Duke University School of Medicine. Other members include Suzanne Baker, St. Jude Children’s Research Hospital, Oren J. Becher, Northwestern University’s Feinberg School of Medicine, Cynthia Hawkins, Hospital for Sick Children, and Duane Mitchell, University of Florida College of Medicine. The Scientific Advisory Council advises the Foundation on how to maximize its resources in funding research for a cure for DIPG. The Council provides strategic guidance on the types of grants to offer and will review grant applications to make recommendations regarding which research projects should be funded. Based on the recommendations of the Scientific Advisory Council, Michael Mosier Defeat DIPG Foundation and The ChadTough Foundation awarded more than $1 million in grants in December 2017. The grants were awarded to scientists conducting research at prominent institutions across the country. The projects range from research on novel immunotherapy treatments for children with DIPG to exploration of key questions about the fundamental biology about the disease. The foundations plan to fund more research in 2018. Jenny and Mark Mosier established Michael Mosier Defeat DIPG Foundation in 2015, after the passing of their 6-year-old son Michael. The Foundation is committed to finding a cure for DIPG and works to fund promising research and raise awareness of the disease. The Foundation works in partnership with other families through its Defeat DIPG Network. We are honored to have foundation chapters operating in Illinois as Anthony’s Avengers Defeat DIPG Foundation, in Pennsylvania as Addison Grace Defeat DIPG Foundation, in Texas as Connor Man Defeat DIPG Foundation, and in Washington as Avery Huffman Defeat DIPG Foundation.